GREENLAND (KFSM)--No one will soon forget the final non-conference game of 2017. While Greenland and Gentry wasn't an eye popping matchup on paper, the Pirates and Pioneers produced one of the state's most thrilling showdowns all season. Greenland prevailed 76-71 but won just two of its final seven games and missed the playoffs. "We were high on ourselves and just didn’t recover from it and that’s what brought us down," senior Ethan Holte said. "If we’re on top of 76-71 I’ll be okay with that," coach Lee Larkan said. "But yeah we want to be a little better, hopefully we’ll be a little better on defense and hopefully we can still score. And I think we should be able to score." "We thought we were better than everyone else, we just gotta see where we’re at. Can’t overestimate our team," senior Hayden Stout said. The focus for 2018 has been more on the little things, like practicing with more energy and adding weight, along with having a short memory. "Restart each week, have fun the night of, forget about it the next morning, start the next week," Holte said. "The most exciting thing is we went to put shoulder pads on the other day and we had a lot of the guys who wore large shoulder pads last year, they don’t fit them anymore," said Larkan. "We’ve had a really good offseason, gained lots of strength." 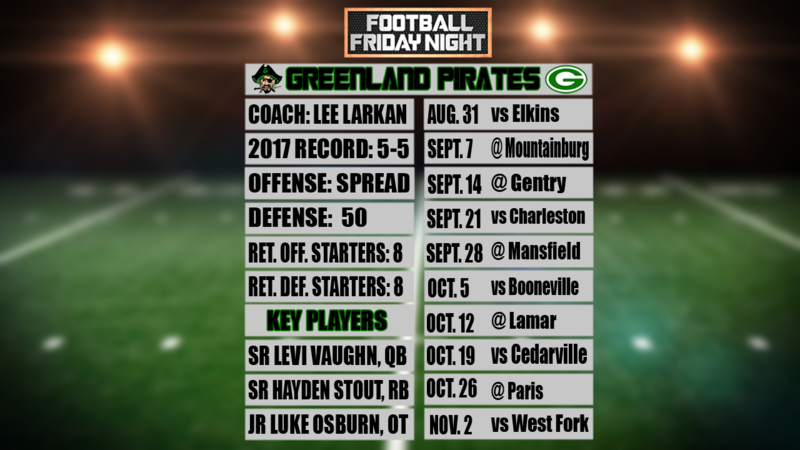 Greeland opens its season in week one by hosting rival Elkins.